Habib University inaugurated Comparative Liberal Studies (CLS)undergraduate program which brings together four branches of knowledge within the field of humanities; History, Philosophy, Religious Studies, and Literature. 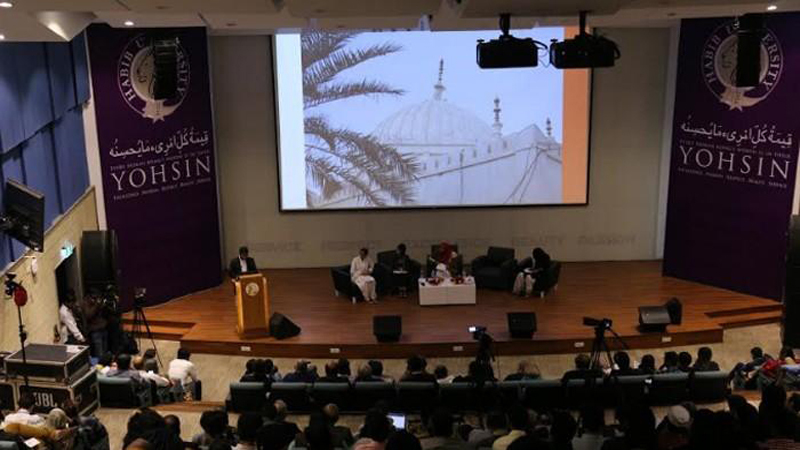 Marking the launch of interdisciplinary program, Habib University held a day-long Symposium titled ‘Critical Knowledge: Pioneering Comparative Liberal Studies at Habib University’. “One of the goals of the new program is to reinvent, re-imagine and revive the knowledge systems that have become marginalized and what the study of ‘humanities’ has been in the past and in the ‘West'”, explained Nur Sobers-Khan, the director of the CLS Program at Habib University. Starting off the event was the introduction of CLS by Nauman Naqvi, Assistant Professor of CLS. The event featured leading international scholars with the keynote speakers Abbas Amanat, an eminent historian of Iran and the Persianate world, who has taught at Yale University for almost four decades, and Dr. Jo-Ann Gross from The College of New Jersey, an authority on Sufism and the Ismaili tradition in Central and South Asia. The Symposium’s two panel discussions included ‘Coffee with Plato, Al Farabi, and Marx’, with Dr. Muhammad Haris, Dr.Nauman Naqvi, and Dr. Jessica Radin, who discussed the relevance of ancient, Islamic and modern philosophy. The second panel discussion titled ‘Doors of Perception’ included Dr.Nur Sobers-Khan, Dr. Fracisco Jose Luis, and Dr. Waleed Ziad, all faculty of the CLS program at Habib University. Published in Daily Times, December 16th 2018.